It’s that time of year yet again—time to toss the 2018 calendar in favor of a crisp, fresh 2019 one. And it’s always nice to freshen up your desktop as well! Check out the brand new 2019 desktop calendars I’ve created for your digital workspace. I’m really excited about all three of these new designs! 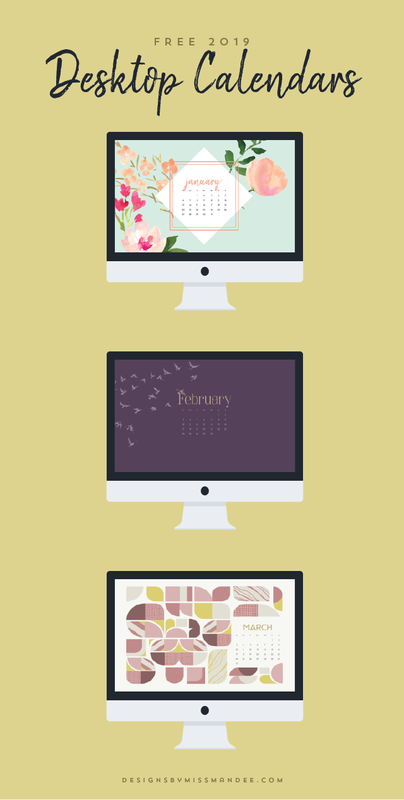 I can’t really pick a favorite, but luckily I don’t have to—I just happen to have three desktops at work. Whenever people walk by my desk and realize that I have a calendar for each background they tease me, but I don’t care—it’s nice to know the date, no matter which screens have windows open. Enjoy your fun, new 2019 desktop calendars! What were some of your 2018 accomplishments or 2019 goals? I love the things you make. Specialy the disney lantern and the Christmas items. I wonder if you have also made a pappercut shadow box? I love them to and you make such a beautiful things I question if you have make them to? Thanks Petra! I have made one papercut shadow box before—it was a project I just did for myself. I’ve thought about doing something similar for my blog, but, honestly, it was too much work to be something I could share here for free. These are great! I’ve really been enjoying your designs. Thank you so much, Mandee! I found your wallpapers in 2017 by random and have been using them every since. Thank you so much for your hard work and making my computer feel so beautiful every time I open it!